Despite already voicing out his intention to stay with his current club, Napoli’s highly rated midfielder, Marek Hamsik, apparently still open himself for a move from the Italian club. Speaking in an interview with Italian TV station, RAI, the midfielder reveals that he won’t be able to reject an offer from English giant, Manchester United, should Sir Alex Ferguson’s side does make an official request for him. 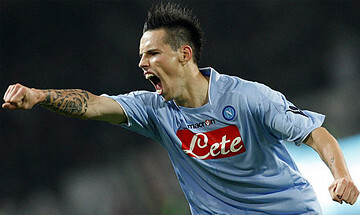 “I have to admit, it would be difficult to say no to Manchester United,” Hamsik stated. Although admitting that he would be considering a move to England, Hamsik also confirmed that at the moment he hasn’t received any official contact or offer from United. Although he is pleased to be connected with a big team like Man United, the Slovak international didn’t really reveal the real reason of his interest in playing at Old Trafford amidst the fact that the Premier League giant are known as one of the best clubs in the world at the moment. The talented Slovak midfielder has recently been linked with plenty big clubs lately especially since he has been performing really well for the Partenopei in the last 2-3 seasons, now with the preference he hinted about United, the English club might try to sign him next summer. Aside from Sir Alex Ferguson’s side, other teams that have been monitoring the 23-years-old midfielder are the likes of Inter Milan, Ac Milan and Juventus. Considering his current contract with Napoli that will last until 2015, it would be unlikely to see him move away from the South Italian club this winter especially with the pretty high price tag that has been set on him by his team. However, it would be a different story in the summer especially should the Slovak international decided that it’s time for him to look for new adventure and also a team that can help him improve his footballing career. The 23-years-old is well known and very highly rated in Serie A as he has the abilities that made him being considered as one of the best midfielder in the Italian league at the moment. The former Brescia youth player is well known for his complete quality as a midfielder as he possessed the vision, skill, speed and work rate that allows him to simply dominate the midfield area every time he plays.